The best way to sum up the plot of Neil Simon’s Rumors is this: the dinner party’s host shoots himself, and hilarity ensues. The Trinity College Dramatic Society (TCDS) presented a rendition of the 1988 play from November 22–25, directed by Vanessa Perruzza. The setting of the play is the 10th anniversary party of Mira and Charles, although neither character actually appears in the show. Charles is unconscious and wounded from a shot to the ear and Mira is missing. 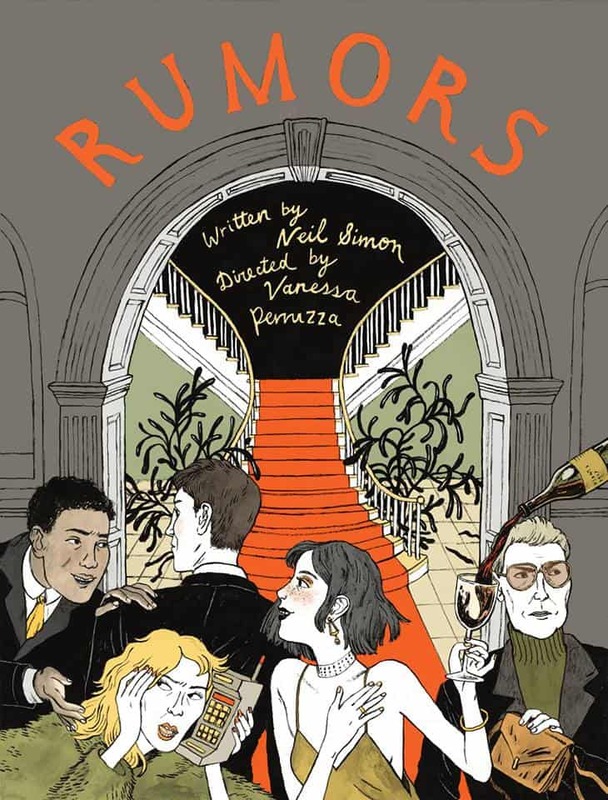 Rumors is a farce that combines slapstick humour and witty commentary on upper-class life, as well as the dinner party/murder mystery trope. It is full of big personalities and big misunderstandings. At times, neither the audience nor the characters know exactly what is going on, a recurring theme throughout the show. The play opens immediately after an accident has occurred, although what exactly happened remains unclear. Through a conversation between two of the characters, Chris and her husband Ken, we find out that the host has suffered a minor bullet wound, perhaps attempted suicide. As guests begin to arrive, the characters try to piece together exactly what has happened. Where are the hosts? Where is the help? Is a scandalous affair involved? Why were there gunshots? Those who know try to keep the secret from those who don’t, and the miscommunications and rumours become increasingly elaborate and far-fetched. The characters spend the party trying to save their reputations, marriages, and the dinner itself, while their level of intoxication increases. Gianni Salese gave an excellent performance in the role of Len, as did Kenzie Tsang as Chris. Perruzza did an outstanding job as director. The set and staging made the audience feel as if they were sitting in the dining room with the guests, experiencing the commotion firsthand. Simon originally wrote Rumors to cheer himself up during a period of depression, and the dark comedy definitely lived up to this goal. Although it carries an undertone of sadness, Rumors was funny, smart, and featured some great talent.